Here is a bunch of songs by TV stars who probably wish they'd never sung them. Let's start with Burt Ward, who portrayed Robin on Batman in the mid '60s. The song "Boy Wonder I Love You" is fairly typical '60s teen idol dreck. But it's teen idol dreck written and arranged by Frank Zappa! Plus, some of Zappa's original Mothers of Invention, including my late pal Jimmy Carl Black, played on the record. 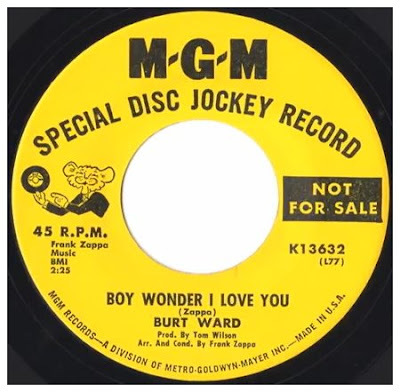 As previously noted by Dangerous Minds, Ward wrote about the record in his 1995 autobiography, Boy Wonder: My Life in Tights. They had incredibly long, scraggly hair, and clothes that appeared not to have been washed in this century if ever. These were musicians who became famous for tearing up furniture, their speakers, their microphones and even their expensive guitars onstage. They were maniacs! ... Their fearless leader and king of grubbiness was the late Frank Zappa. (The full name of the band was Frank Zappa and the Mothers of Invention.) After recording with me, Frank became an internationally recognized cult superstar, which was understandable; after working with me, the only place Frank could go was up. Perhaps the greatest TV news anchor to never exist was Ted Baxter, portrayed on The Mary Tyler Moore Show by Ted Knight. Here's an ode from Ted to another television journalist Barbara Walters from his 1975 novelty album Hi Guys. I'm still searching for the restraining order Walters surely filed after hearing this.